I’m pleased to announce the publication of my book, Decisive Battles in Chinese history. The study of Chinese military history faces steep hurdles where English academics have to afford trips to far away archives, from Chinese cultural values and the way events were transmitted to the West. The first Westerners who had significant academic engagement in China were Jesuit missionaries, beginning in the sixteenth century. They interacted with Chinese elites who also disdained war and emphasized cultural values over military ones. The Jesuits sent back to the West the stories of Chinese civil virtue and martial impotence. (Ironically, Jesuit cannon making skills were among the most sought after technologies the Chinese wished to obtain.) Chinese scholars emphasized the strongly held cultural values that helped create the great dynasties and almost completely ignored the equally important role of warfare. 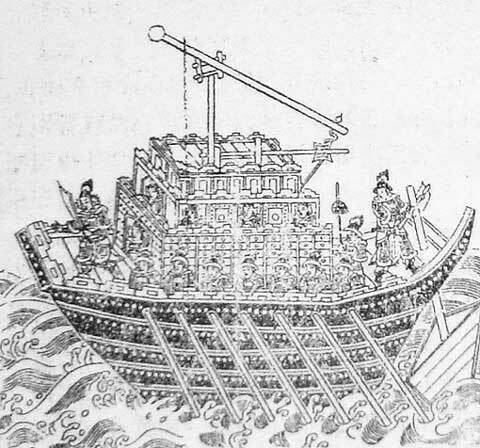 From the first dynasty of China in 221 BC, civilian leaders exercised political dominance over the military. Though outranked by their civilian counterparts, the military men held great power, and it was the use or lack of military power that brought about the rise and fall of dynasties. It’s true that many Chinese leaders adopted passive or nonviolent ways to subdue their enemies, such as marriage proposals or generous trade agreements. But these were often done as a way to compensate for military weakness. During times of martial strength, Chinese leaders preferred pacification campaigns because they had the means to carry them out; during times of weakness, in contrast, they often adopted other methods. But it was the relative martial strength of the dynasty, its ability to project power, and other practical considerations that often determined strategy, not an overwhelming cultural preference for pacifism. There are many books about major or decisive battles, but few have more than a handful of non-Western battles, nor do they examine the battles with the expertise of a Chinese military historian. If they do include non-Western battles, it is usually because of their association with (and defeat by) the West. In A History of War in 100 Battles, for example, only four battles do not have a European or American opponent, and only six are from the Southern Hemisphere. Another book presented itself as the authoritative guide to battles in world history but didn’t include a single section devoted to Chinese history, the index did not include an entry on China, and the book contains only scant references to Japanese history. It is true that China entered a long period of military weakness at the same time the West was expanding its influence globally, and there are significant questions about its capabilities even today. But the picture is far more complicated than the West dominating and China trying to keep up. China has one of the oldest civilizations and has a claim to some of the longest continuous cultural traditions. It fielded armies as big as half a million soldiers during the Warring States period, or roughly the same time that Rome was little more than a collection of huts on a few hillsides. (See more about numbers and army sizes below.) China invented key technologies such as the crossbow and gunpowder. During a time when America was a small nation clinging to the Eastern Seaboard, China extended its rule over hundreds of thousands of square miles with hundreds of millions of people. It also has a history that seems almost cyclical at points, where a strong dynasty would eventually collapse, followed by a period of weakness and then consolidation and expansion under a new emperor. It had the singularly unfortunate timing to enter a period of weakness and fail to industrialize during a period of rapid change in the West. For example, at the start of the Opium War in 1839 (see chapter 10 of my book), the Chinese armies possessed fairly modern weapons and defensive fortifications but could not keep pace. The British fielded their first ironclad the very year the war started and had several other advantages that unfairly cast the Chinese as backward and hopelessly inferior. 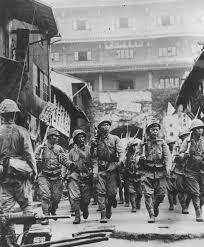 Japanese soldiers entering the port of Ningbo during the Battle of Shanghai, 1937. This book uses battles as a hook, and each chapter highlights an engaging battle that selectively focusing on unique Chinese characteristics including their major belief systems, ruling ideology, connection between technology and warfare, Chinese military theory, major political events and key rulers, their foreign policy with their neighbors, cultural developments, and their interaction with the West. The text pushes back on a variety of ideas and stereotypes ranging from the Chinese use of gunpowder, their supposedly weak reaction to the West, the viability of the Dynastic Cycle in studying history, the context of their military theory, the exclusivity of martial and cultural spheres, and the uniqueness of Western imperialism. It offers a groundbreaking reassessment of Mao Zedong’s leadership and his impact on the development of guerilla warfare. In world filled with disturbing reports of conflict and potential warfare, Decisive Battles in Chinese History offers a unique addition to students, historians, and anybody wishing to better understand Chinese history. This is great but you might ask, what does this have to do with Mormonism? Truthfully, not a great deal. Like the Pirates of the Caribbean, when I get involved in Mormon discussions I feel a bit like Captain Barbosa. I’m just a humble pirate or military historian. The intersection of my studies with Mormonism remains somewhat small. I mostly like to discuss military history, Mormon stances on warfare, and specialize in warfare in the Book of Mormon. But I’m also branching out as a thoughtful member of the church who is struggling with the standard Orthodox positions and I appreciate Wheat and Tares bringing me aboard. That being said, there are still several intersections between Decisive Battles and Mormonism. The most ironic one comes from the charges of antagonistic Mormon critics. I have a book coming out that looks to be, if I can say so, quite good and successful. One of the chapters I presented in Kings College London, in front of Richard Overy (see footnote 2), to enthusiastic applause. But when I take the same skills, research, methodology, and apply them to the Book of Mormon suddenly I’m some Mopologist hack. In fact, I know that the critics tend to obsess over details and try to delegitimize scholars that sustain the Book of Mormon as an ancient text, so I tend to work even harder on my Mormon studies than my already successful writing career. More substantively, I have an entire chapter that discusses numbers in Chinese history. The Battle of Fei River was, naturally, one of the most decisive battles in Chinese history. Fought in the late 4th century AD, a rising dynasty based in the north marched south to conquer the dynasty who fled there a century earlier. (I’m being somewhat brief here, but you can get the fun details in the book.) The battle was a loss for the north, and their empire quickly disintegrated, and resulted in the longest period of disunion in Chinese history. Not surprisingly, this is called the Period of Disunion and it’s roughly contemporaneous with the fall of the Roman Empire and early medieval history. Northern Qi heavy cavalry from the 4th century AD. They were particularly unsuited to warfare in Southern China. Reportedly, Fu Rong lost over 800,000 men in the Battle of Fei River, and this is the big intersection with the Book of Mormon. The numbers could either be correct or wrong, but either solution doesn’t present a problem for the text. Exaggerating the size of armies and numbers of the dead was often done for several reasons. Scribal error, the unreliability of eyewitness estimates, and the use of the wrong numbers to make a deliberate moral or political point were the primary factors. Ancient historians often wrote not to tell what happened but with a specific moral purpose. Hence, they didn’t have the same scruples about bending facts to fit their story. In this case, one of two sources for the battle was written during a period in which the contemporary ruler planned a massive, large scale invasion of Korea, so Confucian historians likely massaged the numbers in order to dissuade the current emperor from his endeavors. The other source that records this battle was written by the southern dynasty that survived, and hence they also probably massaged the record to enhance the legitimacy of their rule. Even though they were likely inflated or exaggerated, the numbers were still within the realm of possibility. While modern readers should have a healthy skepticism of numbers, the ancient Chinese could field and kill large armies. 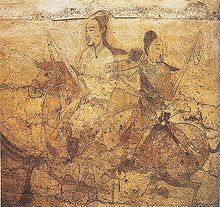 The War of the Eight Princes (also a chapter in my book), decimated the western Jin dynasty in ancient China; scholars argue that the Jin army had seven hundred thousand soldiers at the start of the war. The battles from this civil war raged across northern China for only about six years, and one ancient historian suggested that capital province had only 1 percent of its population survive the conflict. Modern historians posit that the powers in the Warring States period from almost a thousand years earlier could possibly field up to half a million men for one campaign. Historians will likely never know what the true numbers were. There is good evidence that the numbers in the Battle of Fei River were wildly inflated (but just as strong evidence to say that those numbers were still possible) and that they were overstated because of political and cultural factors. Whatever the size of the army, the effect is not in question as the northern dynasty quickly collapsed after their battlefield defeat. 12th century ink painting of the 3rd century Battle of Red Cliffs. Careful readers will of course be reminded of supposedly ludicrous accounts of million man battles in the Book of Mormon. I’m giving you the short version because this post is already getting long, but as you can tell from the above discussion, this is a bread and butter topic for military historians. The first modern historian, Hans Delbruck, reassessed battle numbers in classic and medieval sources. When I say I take the same methods and techniques and apply it to the Book of Mormon this is exactly to what I’m referring. I have several chapters and blog posts that deal with this subject in great depth and I will probably detail them in future posts as they are predictably brought up by critics. My answer to the question of wrong numbers in the Book of Mormon is the same as those for Fei River, the numbers could be right or wrong but the text is in good company either way. Suggesting they might be plausible, the Aztecs raised up to 400,000 men for routine campaigns, and the Toltecs reportedly lost millions in the course of a campaign. The Nephite and Jaredite numbers are well within historical norms, for the region. And the evidence of those battles remains as hard to find as other historical norms. The archaeological evidence of battles is notoriously difficult to find because battles rarely produce permanent structures that remain to be studied hundreds or thousands of years later. And the most prominent and permanent features of warfare like walls are often mistaken for slight rises in the ground and often missed. Yet critics of the Book of Mormon expect the evidence to look like Triceratops poop from Jurassic Park. But let’s say the numbers are wrong. Brant Gardner has research that some battlefield numbers could be symbolic, and Mormon would have the same proclivities and tendencies as other ancient historians that had trouble counting large numbers or deliberately exaggerated to make a moral point. More interestingly, there are additional avenues of approach in Book of Mormon that takes numbers as unit names and combines that with something called the military participation ratio to come up with a much smaller number. A century, centurion and myriad are two examples from Roman and Greek history that show how 100, one hundreth, or 10,000 might not refer to a number of people. The Roman century actually had 80 people by the late Roman Empire and that’s not including any sick, wounded, or desertions that likely would have made a number of soldiers in a century far lower than what the recorded that recorded the number of legions and centuries would have the reader believe. (As I discussed in my first book, the Theodosian Code allowed soldiers up to four years of leave without significant punishment, so this was not a random concern.) Again, ancient historians did not have a golf clicker as an army walked by, but relied upon supposed eye witness accounts based on things like the number of banners, but not the exact troop strength of each unit marching under the banner. The military participation ratio is the number of soldiers compared to the population that a society could field. 25% was the upper limits for any society and the normal about 15%. The final number at Cumorah was listed as 230,000 and 15% of that ratio is 35,000. That number is right in between the only two specific numbers listed earlier in the text: Mormon 2:9 (42,000) and 2:25 (30,000). (See Mormon 6:7 as well, which suggests women and children were in the order of battle and strengthens the idea that the final number is the total population.) Just from a logistical point of view I have trouble believing Mormon started the war with 30,000 but at the end of that desperate war of survival 20 years later he had seven times that number. (Though Hugh Nibley suggested that’s because we are only getting one minor thread of their defeat personally witnessed by Mormon until the final gathering of the entire realm.) That being said, 23 unit names of 10,000 filled with only about 30,000 military aged males (calculated using the mpr) and civilians makes much more sense to this historian. This might open me up to charges of being a mental gymnast, yet I’ve seen the same arguments modifying the size of armies listed in ancient sources, done by first rate scholars in excellent journals, and they are published with a golf clap from the academic community. Thanks for reading this post. I hope you found it informative and have better insights into my background and what I bring to the study of scriptures. What kind of discussions of Chinese topics would you like to see here? What kind of subjects would you like to see concerning the Book of Mormon? Why is there a different perception between Mormon and non-Mormon research despite the same skills and methods being used? It can’t just the supposed begging the question of apologists, but I believe it’s a rather skilled campaign to delegitimize so called “faithful” research. For more pictures that didn't make it into the book please see my personal blog. A good book that shows how Chinese officials were far more practical and realistic in their war making than the stereotypical portraits painted of biased Confucian historians can be found in Peter Lorge ed., Debating War in Chinese History (London: Brill, 2013). Richard Overy, A History of War in 100 Battles (New York: Oxford University Press, 2014). Richard Holmes and Martin Evans, eds., A Guide to Battles: Decisive Conflicts in History (London: Oxford University Press, 2009). N. Whatley. "On the Possibility of Reconstructing the Battle of Marathon" N. Whatley, Journal of Hellenistic Studies 84.1 (1964):119-139. Kelly DeVries. "The Use of Chronicles in Recreating Medieval Military History,” Journal of Medieval Military History, 2.1 (2004): 1-30.